What are the most innovative recruiting solutions 2014? It was a long, hard way to go for the winners: after a nomination phase with 15 nominees and a following online voting with almost 2000 votes from all over Europe, the chosen 5 finalists were ready for the Recruiting Innovation battle on the RIDE: Recruiting Innovation Day Europe in Zurich on the 8th of April. Within the Recruiting Innovation Battle each of the finalists were allowed to pitch their innovation for only 8 minutes in front of the audience of the RIDE. Then the audience casted their vote. The first voting was that close, that we needed a second ballot for the first place. 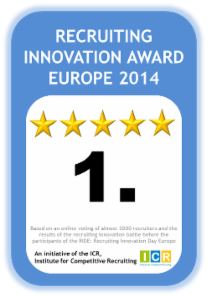 After all this long way, here is the final ranking for the Recruiting Innovation Award Europe2014. By clicking on the picture of the winning solutions you could download the presentation of the pitches and get to know the solutions better. All Recruiting Innovation Award entries have been validated and the entries voted online by over 10.000 recruiters. 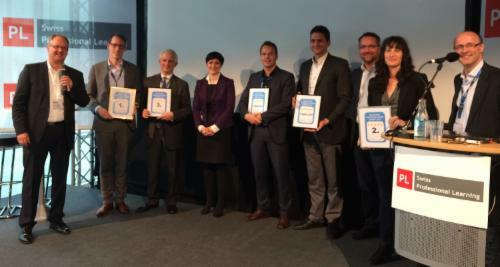 The top five entries have been invited to compete in the Recruiting Innovation Battle on the RIDE in Zurich, each given a timed, 8-minute recruiting innovation pitch before the RIDE audience. Each Recruiting Innovation Award pitch is assessed by the audience and after all presentations the audience votes to select the winner. The Recruiting Innovation Award 2014 Ceremony is an integral part of the RIDE: Recruiting Innovation Day Europe.